Should you learn to groom your dog at home? Absolutely! While your dog might look fabulous after coming back from the groomer, there are several reasons you’ll want to know the basics yourself. 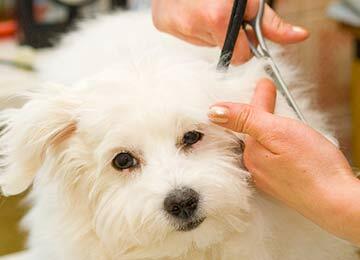 First, a professional grooming can be costly, especially if you’ve got a long-haired or intricately-trimmed dog. This is especially true if you’ve got a terrier you want ‘hand stripped’. That can run into hundreds of dollars very quickly. Second, some dogs get really stressed at the groomer. 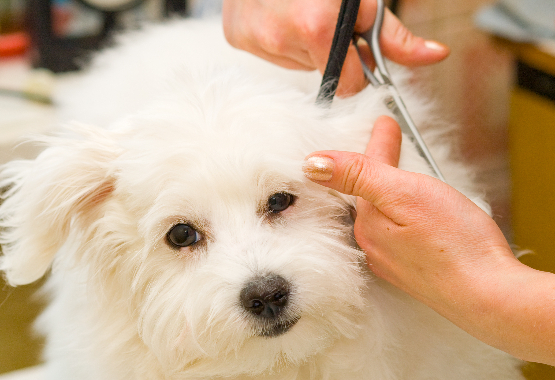 If you can extend the time between trips to the grooming salon with a quick trim, you’ll save your dog time and worry. Finally, there are those times when dogs just get into stuff that they shouldn’t and need a quick clean up. You’ll want to check regularly for burrs in the coat, burrs or stones tangled in the hair between the paws, and other problems that can’t wait until the next salon visit. Remember, some dogs have fur and others have hair. If your dog has an undercoat and sheds fairly often, your dog has fur. Fur will will grow to a specific length and then fall out, so dogs with fur tend to shed more than dogs with hair. A hair coat consists of a single coat -- think Afghan here -- and while usually longer, goes through a slower grooming process. 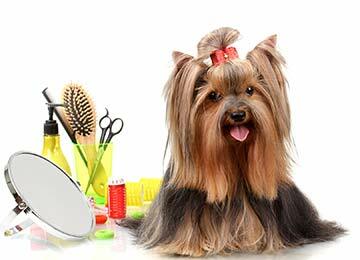 Before you even turn the water on, start by giving your dog a thorough brushing to remove dead hair and tangles. Skipping this step can turn a haircut into a complicated, labor-intensive process. Then turn the water on in the bathtub and adjust the temperature. Let your dog get used to the sound of the running water. It might take a few minutes, unless they’re already sticking their snouts into your shower every morning. Have a pitcher or scoop of some sort to use to pour water over them, or you can use a handheld sprayer if you have one installed. Pro tip: if your dog is spooked by water, try smearing some peanut butter on the shower wall or side of the tub. MOST dogs will be so engrossed in licking it off that they won’t even notice they’re getting a bath. 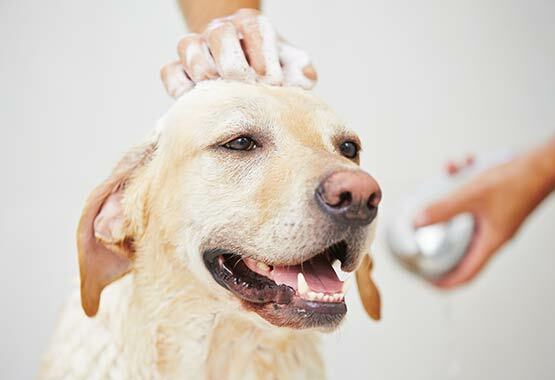 Using a mild pet shampoo, start at your dog’s neck and work your way back toward the tail. Go slowly, speaking reassuringly, and work in sections, shampooing about ¼ of the dog at a time and then rinsing with warm water. When you’re done, give one last all over rinse. You can save the face until last and may want to use a washcloth to avoid scaring your dog. Pay special attention to the ears and between the paw pads, checking for mud balls caught up in the fir or burrs. Dry your dog as well as you can while he’s still in the tub and try to avoid the usual mad dash through the house with your wet dog shaking all over. Pro tip:shut the doors to all bedrooms so you don’t have wet dogs on your bedding. 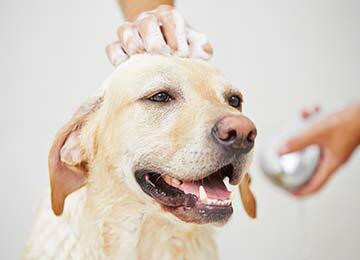 After bathing, simply spray a mist of conditioning spray onto your pet’s coat while still damp. Hold the spray about six inches from your pet while avoiding the eye area. 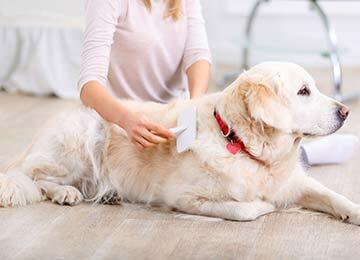 Work the conditioner into your pet’s coat with a brush and either allow to naturally to dry or groom as usual. After your dog is dry, you’ll need to brush him again to remove old hair that the bath has loosed up. You’ll also be able to remove any mats or tangled bits you missed. Slicker brushes are an excellent choice. Before even touching a pair of scissors or clippers, you need to address those mats. Using an electric clipper on matted fur can be very painful for your dog. Try to get rid of mats by using a detangling or de-matting spray. Spray the mats and knots according to the product's instructions and then let it set. The spray should loosen knots and allow you to brush them out more easily. A bath, brushing and haircut all in one day is a lot for any dog. Consider spacing out the process over several days. For instance, you might check for matted fur the day before you intend to give your dog a bath, then give the bath the next day, then actually cut the hair on the third day. 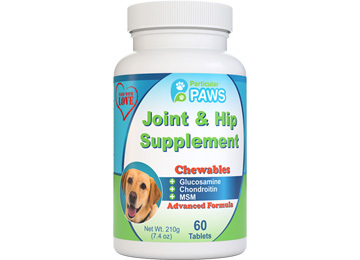 You can also prepare your pup to stay calm and comfortableduring this stressful event with our all-natural Dog Calming Treats. 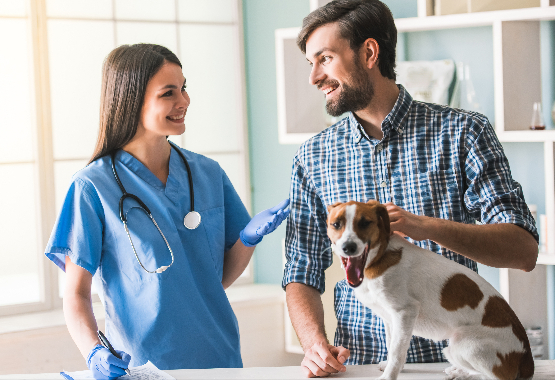 Throughout the process, don't forget to give your dog plenty of encouragement and reassurance.Keep other healthy treats on hand to reward your dog for good behavior or for just tolerating the experience. Don't be afraid to spread out the haircut, especially if your dog is very anxious or it's the first time that you are doing the grooming. Cutting hair around the face and paws on separate days can be helpful and doesn't leave you dog looking "unfinished." 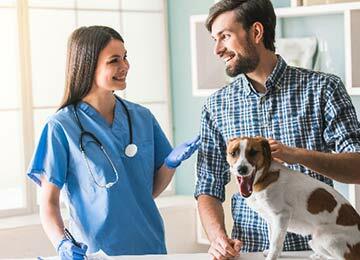 Get tipsfrom your veterinarian or a professional. Every dog breed is slightly different, and this includes their hair. Check out the standard haircutfor your dog's breed as a reference. Breed club websites are a great resource. Familiarize yourself with the clippers. Find the most comfortable way to hold them. There are some areas where you'll want to use scissors. Take caution around the face and ears. Your dog will be more nervous about you cutting around the eyes, nose, mouth, and ears. Encourage and speak calmly to your dog during this time. Use regular scissors around the cheeks and above the eyes. 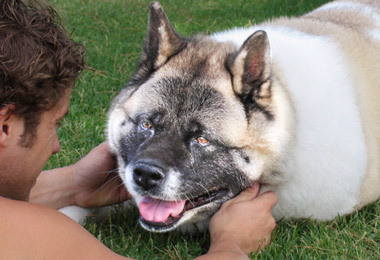 To achieve a more rounded head on a medium-to-long-haired dog, you can usecurved shears. These will give a rounder cut than regular scissors will.Comb the hair around your dog's face occasionally to see what areas are uneven. A dog's paws are another area where you might want to use scissors. 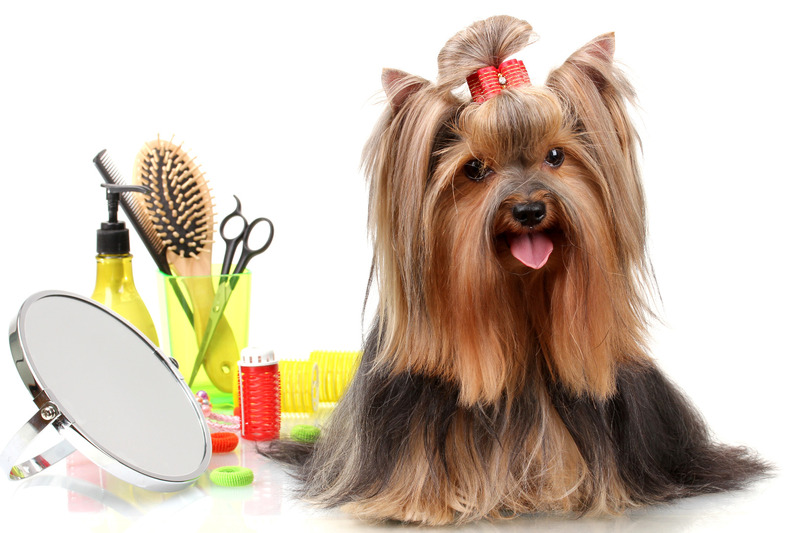 To get long hairbetween your dog's toes, brush against the direction of the fur and cut the lifted parts. You can use an electric clipper for hair between the pads of your dog's feet, but some owners prefer to use scissors. 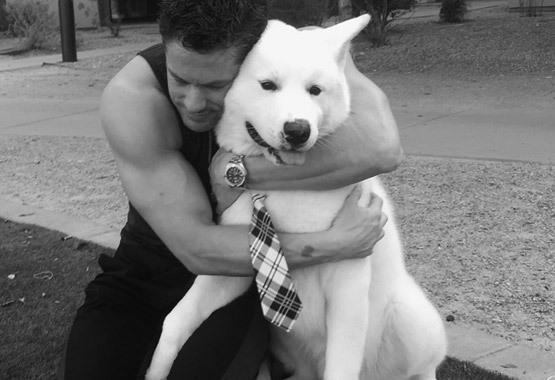 One of the most difficult parts of grooming at home is working around your dog's reactions. Professional groomers use a noose to keep the dog still. 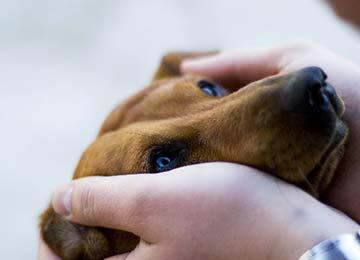 You can hold your dog or ask another person to help control any sudden movement. If you’re going to be grooming your dog regularly, invest in a quality grooming table. Watch those clippers! They do get hot and high clipper temperatures can burn your dog's skin. Touch the blades every few minutes to make sure they’re not hot. If they are, take a break, switch to different blades, or switch to a spare clipper if you have one. Dull blades also pose a risk to your dog, because they are more likely to leave cuts. Use recommended oils or sprays for your clipper blades. Keep them clean and free of hair after each cut. See a professional to have your blades sharpened regularly. 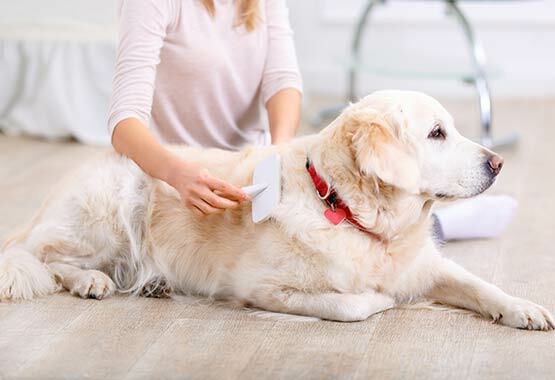 With the right tools and the right attitude, grooming at home can be a pleasant experience for both you and your dog. And don’t forget those calming treats! At last, it's time to bring out the clippers. While you can cut all of your dogs hair with scissors, this would drag out the haircut longer than it needs to be. Electric clippers aren't difficult to use once you're used to them. Once you choose your clippers, it's also important to give your dog time to become used to them too. Let your dog hear the sound of the clippers beforehand so he isn't startled by both the noise and the haircut itself. Choose a quiet location where there will be no sudden noises or distractions to startle your dog. If possible, enlist a family member or friend to help. 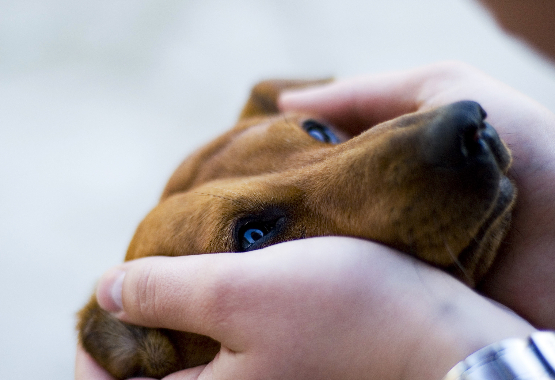 Having another person to hold and calm your dog when necessary can make the process a lot easier. Start from the back of the neck and move down the body. It's most efficient to go from the neck and make your way down to the back leg on one side first, and then switch to the other side. Cut in the same directionthat your dog's hair grows using slow strokes. Going in the wrong direction produces unnatural looking lines in your dog's fur. On our dog's underside, it's okay and sometimes easier to cut in the opposite direction of your dog's growth. Avoid pushing too hard or moving the clippers too quickly, which can result in louder noises and startle the dog. If some areas of your dog's body look uneven, you can try using a slicker brush. Brush your dog's fur in the opposite direction to fluff it up, and then use the clippers to go over that area again. Once you've shaved down your dog's body, you can use the clipper along the sides of your dog's face, if she's not too nervous. For the rest of the face, you need to proceed more carefully. Your dog will need a brush after their bath. A thorough brushing ensures that old hair is removedand can help you identify any mats. Use a slicker brush, or your usual pet brush.